Presenting a Guest Post by Indrani who shares her travel stories and pictures through her blog isharethese.com. Do read the blog and drop a comment below. Thank you so much for such a lovely Guest Post, Indrani ! 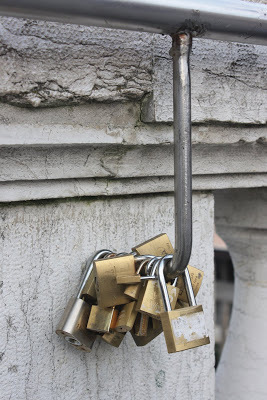 When I first saw locked locks on railings of Ponte dei Scalzi, one of the bridges over Grand Canal of Venice, I was a little perplexed. No sigh of any keys around. In IndiaI have seen bangles or cradles being tied to branches of trees, that too in temple premises. That was in 2010, I was a little less traveled then. Little bit of search in Google and I was flooded with information on these locks. They are no ordinary locks; they are Love Lock or Love Padlock. Couples in love, lock them to a public object, most often a bridge, and throw the key into water. It is believed that this act symbolizes their love which will never end. Obviously if one can’t find the key, the lock can’t be unlocked. What might have started as a simple innocent loving act has gained popularity and grown in huge proportion in the last twenty years! While to a tourist or passerby this may look amusing or uninteresting, for the city authorities it has become a nightmare. They consider it as litter, vandalism causing damage to public property. If you look at the mathematics of these acts you will be convinced why these acts need to be checked. The weight of love locks on the pedestrian bridge of Parishad crossed 93 metric tones. Obviously when the bridge was designed it did not cater to this increasing weight over the years. Part of the structure that held the locks collapsed under this increasing weight. Officials then started removing the locks from the bridge to avoid further damage. Since June 2015 the metal grills have been replaced with lock proof plexi glass panels. There has been mixed reaction to this. While some are of opinion public utility objects should be spared of such symbols of love, there are some who mourn over the removal of these icons. There have been demands and requests for putting them up in museums as its part of the romance of Paris. A collective effect of these is causing damage but they can be removed at regular intervals. In my opinion these removable love locks is way better than defacing monuments by scratching and scribbling on them! What is your opinion?